If you're like me who always finds themselves in the kitchen the you'd probably already know why getting the best meat cleaver is important. Meat cleavers are practically the backbone to making sure that your kitchen experience would not be too troublesome. 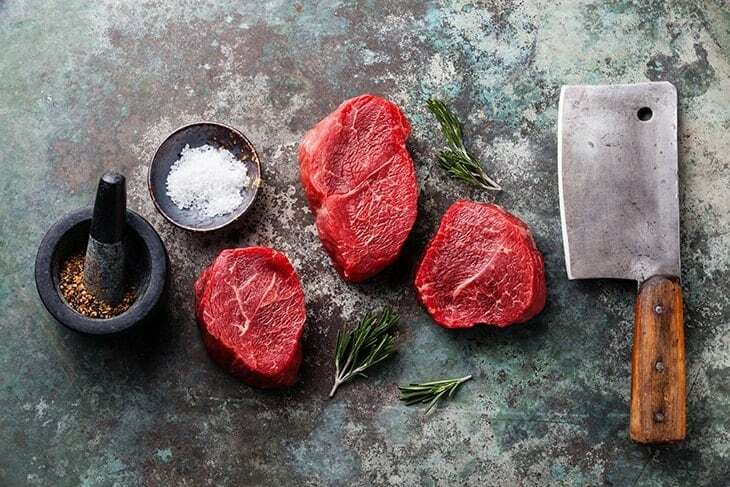 I remember when I first started to learn how to cook, I would often have a hard time chopping those thick pieces of meat because I did not have the right knife for it. Oftentimes, I would not have the right size and thinness because my knife only cuts through so much. When I discovered the usefulness of meat cleavers, it was such a revelation for me. Preparing my ingredients became so much faster and easier. It actually made me feel like a top chef even though I was just still starting to learn how to cook. Now, I can't live without my handy meat cleaver. When my mom advised me to get a meat cleaver for my kitchen, I thought it would be so easy to purchase one. But, lo and behold, I was faced with so much difficulty in choosing. I did not even know where to begin and what to specifically look for. 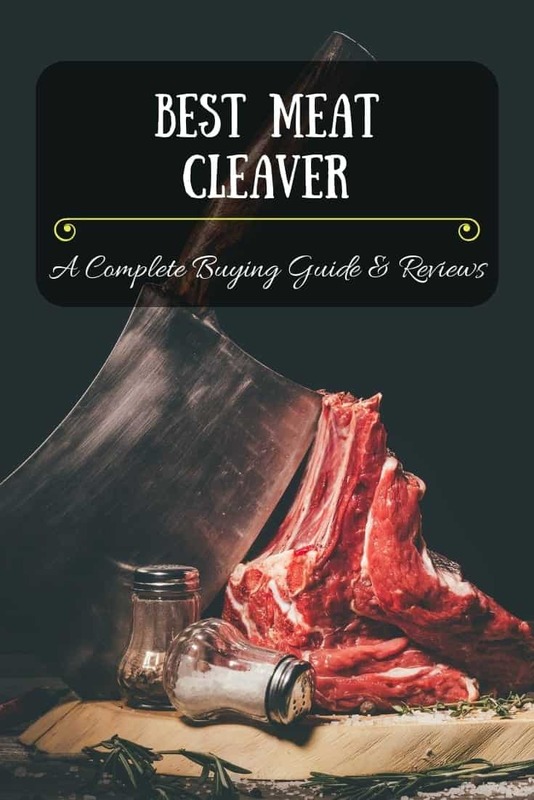 Because of this, I did have my fair share of hits and misses with my purchases and I wouldn't want you to make the same mistakes so I've listed down almost everything I know about getting the perfect meat cleaver for you. If you are looking something that’s tough enough to cut through bones, then this Utopia meat cleaver would do exactly that! Its stainless steel blade is sharp and strong enough to cut through the hardest of surfaces without getting chips or bending which is definitely a nightmare. It also made for comfort. The handle is designed to give you a perfect grip and to reduce wrist tension when cutting through those thick slabs of meat. Those who just loathe to wash dishes would be happy to hear that this meat cleaver is dishwasher safe. However, hand washing it is still the best way to go to ensure that the blade is not compromised at all.Aside from all the features I have mentioned, it also received excellent reviews from previous customers. I have also used this meat cleaver and have nothing but love for it. I was particularly impressed at how sharp the blade is and that they made sure that the blade is at its sharpest when they package it. I also liked how durable it is and how comfortable the handle is. Even when I used it on very thick pieces of meat it still cut through it perfectly and without must effort from me. I did notice that it is a bit top heavy, meaning that the top is heavier that the bottom, but this did not cause me any problems. The best thing about this meat cleaver for budget minded people like me is its price. Its relatively inexpensive but it still gets the job done. If you want to try something different then this meat cleaver is the one for you! It's blade is made of carbon steel instead of stainless steel like most cleavers. This ensures that it'll be corrosion free. This type of blade is also great in keeping any type of bacteria from getting on your meat. The handle is made of rosewood making it more comfortable and more durable. This type of handle is also really really pretty to look at and what made me initially want to get it. It's not like the typical dull black handle you see in most meat cleavers. Aside from the look, this type of handle also offers a more comfortable grip and lessens any chances of getting your wrist strained. Another thing I loved about this is the thin blade that basically doesn't even let sunlight pass through so it's easy to store and very portable. The only thing that I am not loving about this is the price. It's way more expensive compared to the other items on this list so if you're like me who likes to go on the cheap route this might be a hard pill to swallow. I must say tho that I found that the price matches the quality it gives. That being said, other cheaper items are also the same quality. So really this item is best for those who wouldn't mind spending much or those that really like their kitchen items looking pretty. What I really liked about this meat cleaver from Epica is that it doesn’t let any food pieces to stick to the blade. This has been a hassle for me when I was cutting with the other meat cleavers and knives in general that I have used. If food particles keep on sticking to the blade I need to constantly remove it so that it would not cause any problems when I continue to cut other food. With this cleaver, I cut faster and more precise. This is also very useful in making sure that I would not have any trouble in removing any food from the blade when I am cleaning it. Another thing I really loved about this is how sleek it looks. It’ll fit amazingly in any modern kitchen. It also performs very well and is actually very very sharp. It’s also great that it is already sharpened perfectly right out of the box because in some meat cleavers this would not be the case. The only thing I was disappointed about is the grip. Although the handle is comfortable, it is rounded so it can be slippery at times. 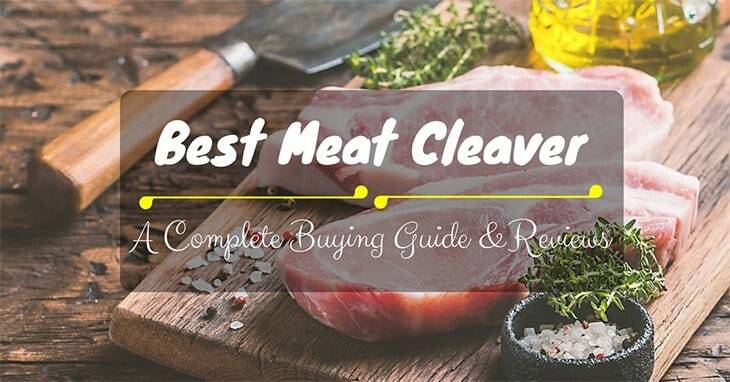 Best meat cleaver – a complete buying guide and reviews! Find the best gear for your #kitchen! What I love about this Winco meat cleaver is that it not only made of stainless steel but it is also made of corrosion resistant blade.. 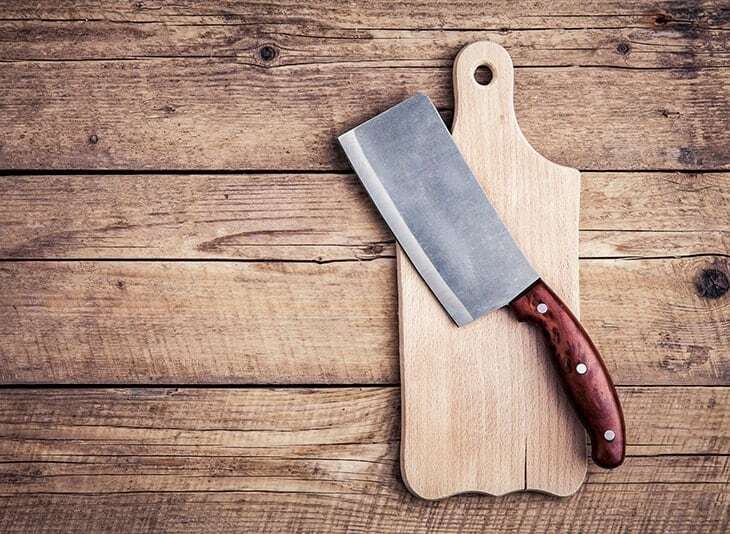 This means that the meat cleaver is free of any risk to corrosion and would would not rust even after continuous exposure to water, oil, or grease. Of course, given that you take care of it properly. I also like that the handle is made of wood. This gave me the vibes that I was actually a traditional masterchef somewhere. The wooden handle also fit perfectly in the rustic theme of my kitchen. Since it’s handle is made of wood it’s dishwasher safe which is a great plus for those who are always on the go and those who dislike washing the dishes.Most of its previous customers are like me and have nothing but love for this product. I love how strong and durable it is. I was even able to cut through thick skinned fruits like pineapples, watermelons, and even coconuts! I was also impressed at how sturdy the handle is and the great grip it gives me. Because of this, I don’t need to be scared that it’ll suddenly fly out of hands. However, I cannot deny that the best selling point of this meat cleaver for me was the price. It’s so much cheaper than most of the others available in the market which makes it a great first cleaver for those that are starting to build their kitchen. Although it comes with a cheap price tag the quality is still great. The blade is a bit thin so even if it is durable it would get some strains after continuous use. If a sleek and very modern knife is what you’re looking for then, this Product Stop meat cleaver is perfect for you. It is almost all silver so it’ll fit right in a modern kitchen and any kitchen actually. It is also said to be able to last you a lifetime so no worries about purchasing anything else. The warranty is great and you can ship it back if you find that it’s not at the level that it is supposed to perform at.The blade performs really well for its price point. It is able to cut through hard surfaces well. The grip is also great and actually allows you to perform at your maximum capacity. It was not as sharp as the other cleavers. There are a lot of things that might distract you from focusing on what really makes a great meat cleaver. Below are the things that I would recommend you to prioritize in making sure the cleaver you’re getting is top notch. As the meat cleaver is used in cutting thick slabs of meat and sometimes even through bones of meat so getting a cleaver that is durable and sharp is key. In the past, metal cleavers used to be made of carbon steel but this is known to get rust pretty quickly and is not really advisable to use. Nowadays, cleavers are made of stainless steel so you should definitely get one that uses this material. In my opinion, this is the most important criteria of all. The meat cleaver should have a great handle and should not cause any discomfort or redness on your hands. No matter how sharp or how efficient it is if your comfort level is compromised you would not be able to enjoy using it and you wouldn’t even be able to use it at its full potential so this is really important in purchasing your meat cleaver. I learned the hard way that no matter how great the meat cleaver you purchased is, you'll definitely run into a lot of problems if you do not care for it properly. The first time I got a meat cleaver I didn't bother to sharpen it or clean it properly as a result, it ended up breaking while I was using it because it got brittle. This showed me that the manufacturers can only do so much but if you didn't care for your cleaver properly it won't last as long as you'd want it to. Below is a quick view on how I would recommend you to care for your meat cleaver. Washing your meat cleaver properly is the first and most important step in making sure that it will perform at its best. It is recommended that you clean your cleaver with warm water and with soap. I know that a lot of us crave for convenience and would prefer to use the dishwasher. Although, most brands are dishwasher safe, I would say that washing your meat cleaver by hand would still be the best way. This way you would always be sure that all the pieces of meat that might cause oxidation on your metal would be removed completely. Washing by hand also lets you see exactly how much dishwashing liquid is applied to the cleaver. When you get your meat cleaver, it would most likely be sharpened already. However, with numerous uses, the metal is bound to get dull and you would definitely need to sharpen it. In my experience, having a dull meat cleaver is a huge no-no! When your metal is dull, you would need more pressure to get the same results you would get from a sharp one. I also noticed that I exert more effort when I don’t sharpen my cleaver regularly and would often even get redness on my hand because of this. Sharpening might be a bit intimidating for first timers. I know that it was quite a stressful feat for me when I first tried. I was too scared that I’d break my cleaver because I was sharpening it the wrong way but getting it correctly is not that difficult. You should just make sure that you have the right sharpening tools. There are several types of sharpening tools in the market. The most popular, and for me the easiest to use, is the sharpening steel. This realigns the metal and doesn’t remove it so no worries about your knife decreasing. To sharpen your meat cleaver, just hold the sharpening steel in a vertical position making sure that the handle is up. Keep it in place then slide the handle along the steel. The direction of your knife should always be away from you. Repeat this motion for five to ten times and you’re good to go. Last but not the least, storage. 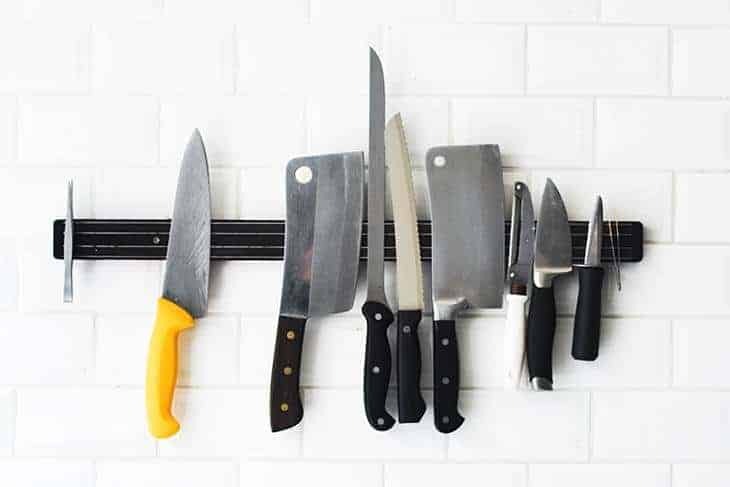 Storing your cleaver in a clean, dry place is the key to making sure that it would not get any rust or that no other microorganisms would accumulate on it. You should also store it in a knife block instead of in your drawer to ensure that there is less damage. Now that we have talked about almost everything there is to know about meat cleaver, I would like to say that the meat cleaver from Utopia is the one that I would recommend. It is inexpensive and does the job really well. It is also very durable so you won’t need to worry about it breaking even after numerous uses. Overall, I honestly believe that each of us has different preferences. 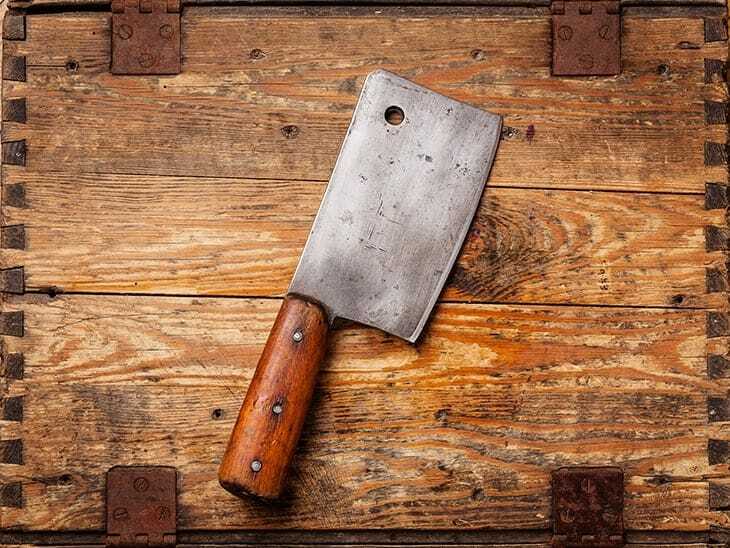 You might have a particular feature that you’re looking for which is non-negotiable but you should still make sure that the meat cleaver you’ll get still ticks all the boxes in other departments. Also, if you feel like I left out other tips or you think that there are other better cleavers that I did not include please comment them below.